If you were curious about whether or not Point% meant anything, remember that in this group alone, there are 27 Stanley Cups to be accounted for. Coaches aren’t flawless, but at least historically speaking, it’s extremely difficult to argue with anyone who is picking up points in more than 60% of the games he has coached. And, if you had Bruce Boudreau as ‘currently most successful head coach in National Hockey League history’, take a bow. Boudreau as a head coach fascinates me. I’ve always been bothered by the reputation handed out to him for those vaunted Washington Capitals teams flaming out in the postseason for a variety of reasons He was frequently painted as the scapegoat for an underachieving team, ultimately leading to his termination in November of 2011. 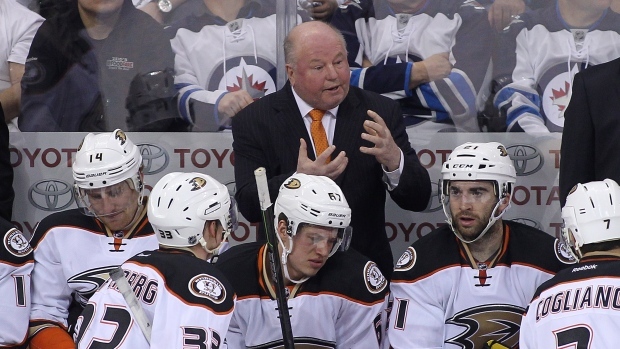 Truthfully, I don’t know how much blame – if any – Boudreau deserved for those playoff exits. Often, it was a combination of a fatal team flaw and the reality that variance can play an awfully big role in determining playoff success. No team benefited more from those weird playoff performances than the Anaheim Ducks. When Bruce Boudreau was fired in November of 2011, the Anaheim Ducks front office didn’t waste a moment. The ex-Capitals head coach was announced as the new Ducks head coach two days after his termination. Since then, it’s been really nothing but sunshine and rainbows in Anaheim. Washington, of course, wound up finding their ‘new’ head coach – Barry Trotz was picked from Nashville last summer, and he’s been a blessing for that Capitals team. Still, it’s important to remember that it took years for Washington to find a Boudreau replacement, and the road to get to Trotz was a bit ugly. Visualizing the effects Boudreau’s had over the years on both of the teams he has coached is stunning. What I’ve done is compile three different statistics – Goal%, Corsi%, and shooting percentage, all at even-strength and through a rolling average – for Washington and Anaheim from 2007 through today. 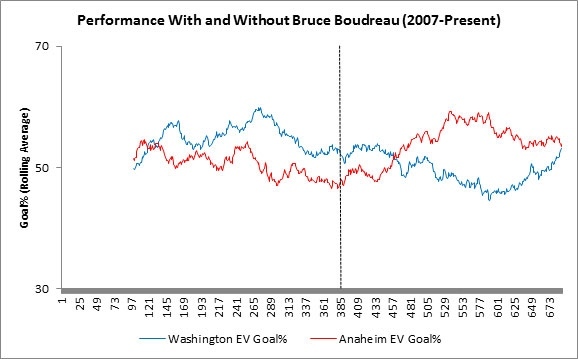 In each graph, you’ll notice a vertical line noting Boudreau’s jump between the two. In each graph, watch how Washington immediately drops off after losing Boudreau, and watch how Anaheim immediately spikes following the hire. First, Goal% -- just the percentage of even-strength goals allocated to Boudreau’s team. 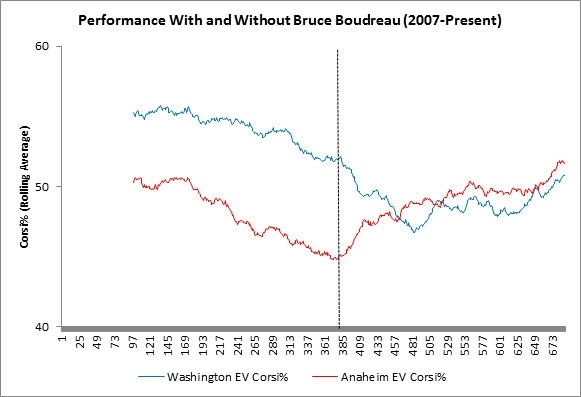 Washington ranged from good to dominant at even-strength under Boudreau. Anaheim, under Randy Carlyle, was right around average. After the switch (again, noted by the vertical dotted line), Washington goes into the tank, only rebounding under Trotz. 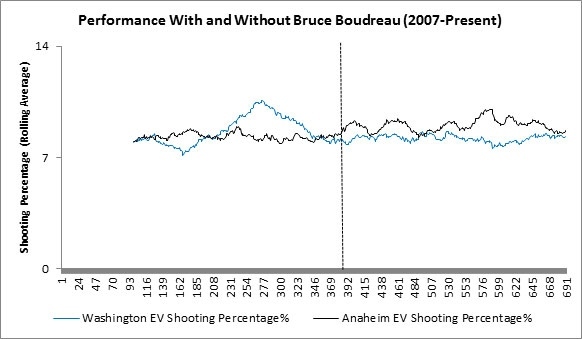 After a brief adjustment period, Anaheim explodes under Bruce Boudreau, and has consistently been above break-even. Now, the goal percentages may be a bit flattering to Anaheim’s play – at least under Boudreau in years past, their Corsi% had lagged a bit behind. But, those numbers have been steadily rising, and this year’s team has been a respectable combination of goal-scoring and play-driving. Washington again goes into the tank, rallying late under Barry Trotz. Anaheim’s consistently moved north, into a territory where they are now out-shooting their opposition. Historically speaking, Stanley Cup winners only range from ‘good’ to ‘elite’ in controlling territorial play. We have yet to see a team win a Stanley Cup while being out-shot over the regular season, and that trend seems as if it will continue in 2014-2015. It’s reasonably clear to me that Boudreau’s loss was a substantial one for Washington, and his gain a great one for Anaheim. The even-strength data supports this. There’s one other curious note about Bruce Boudreau that I’ve alluded to earlier, and that’s the shooting percentage of his teams. I don’t really subscribe to the theory that teams can sustain lofty on-ice shooting percentages over extended periods of time, especially since it’s been exhaustively tested and there’s just not much there. Ultimately, I think shot quality plays a small role (but a role nonetheless) in a team’s overall shooting percentage. If there were a way to control for that small role, though – well, you’d be finding ways to add goals into the standings away from out-shooting and out-chancing teams. Boudreau’s Capitals teams shot at a pretty respectable rate, and had that massive uptick that ultimately crashed back to league norms at the end of his run. Anaheim was just a flat line of shooting percentage, which is fine (and expected) by me. The important takeaway is that, for the most part, Washington was a slightly better shooting percentage team than Anaheim. The Ducks sat right near the league average from 2007-2011 (7.95%) before Boudreau – the Capitals, 4th best in the league at 8.33%. Then, they switch. And since the switch, Anaheim’s shot about 8.75% at even-strength (2nd-best in the league), with Washington sliding down to precisely the league average at 8.00%. Is Boudreau’s system creating a tiny sliver of favorable shot quality? It strikes me as possible. What strikes me as definitive is that Boudreau’s systems churn out quality teams year over year. And, come the Western Conference Final, we’ll get to watch one of the better coaching match-ups in playoff history, as Boudreau is pinned against the venerable Joel Quenneville. The stakes? A chance to play for the Stanley Cup.